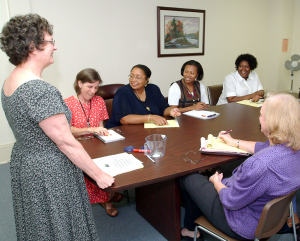 The North Carolina Child Care Health Consultant Training Course is a cooperative undertaking of the NC Division of Public Health and the UNC Gillings School of Global Public Health. The course prepares health professionals to acquire the skills of child care health consultation and coaching. Child care health consultants (CCHCs) work with early care and education (child care) facilities in promoting healthy and safe environments. CCHCs provide comprehensive site assessments, technical assistance, training, consultation, coaching, and child advocacy. The course spans 5-6 months. It includes distance learning or self-study components, two sessions that are face-to-face training, and a final project. Upon successful completion of the course participants are awarded 11.4 CEUs (114 contact hours) from the University of North Carolina at Chapel Hill, Office of Continuing Education and are qualified to fulfill the role of and provide CCHC services in North Carolina. Health professionals with experience and interest in early childhood health and safety. In selecting participants, priority is given to applicants funded by local health agencies, local Partnerships for Children (Smart Start), and Head Start/Early Head Start to provide CCHC services. a minimum of a bachelor’s degree in health education, or health related field with experience in health education. Examples of health related fields include: nutrition & physical activity, oral health, community or public health. Certified Health Education Specialist (CHES) designation is preferred for health education practitioners. Contact the NC Child Care Health and Safety Resource Center for information about applying for the course or call 1-800-367-2229 for information.